Combine tomatoes, stock, onions, peppers, and garam masala in stock pot or kettle. Bring to boil and then simmer until vegetables are tender. Cut turkey into 1" cubes. Add turkey to the sauce and simmer for 30-45 minutes. Peel and dice cucumbers. Combine cucumbers, yogurt, cumin, garlic, and cilantro. Refrigerate. For each serving, put #8 oz. scoop of cooked rice into bowl. Place 6 oz. of turkey masala on rice. 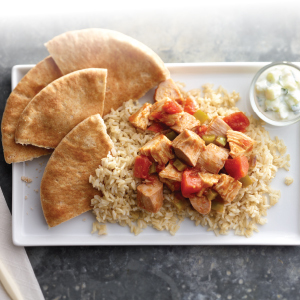 Serve with 1 pita and a #20 scoop of raita. MEASURE: 2 qt. 2 c.
MEASURE: 1 gal. 1 qt. WEIGHT: 3 lbs. 5 oz. WEIGHT: 6 lbs. 10 oz. WEIGHT: 3 lbs. 14 oz. WEIGHT: 7 lbs. 12 oz. MEASURE: ½ c. 2 tbsp. MEASURE: 3 gal. 2 c.
MEASURE: 6 gal. 1 qt. Pita bread, whole wheat, 6"
1 serving provides 2 oz. meat/meat alternate, 2 oz. serving bread/grain, and ¼ vegetable (¼ c. other). *For preparation by a food preparation establishment only, according to the food code or equivalent. Chicken stock, reduced sodium 2 qt. 2 c. 1 gal. 1 qt. Onions, chopped 2 qt. 2 c. 3 lbs. 5 oz. 1 gal. 1 qt. 6 lbs. 10 oz. Bell peppers, green or red, chopped 2 qt. 2 c. 3 lbs. 14 oz. 1 gal. 1 qt. 7 lbs. 12 oz. Garam masala spice blend ½ c. 2 tbsp. 1 ¼ c.
JENNIE-O® Boneless Turkey Breast & Thigh Roast, # 317004, thawed 8 lbs. 16 lbs. Cucumbers 4 lbs. 8 lbs. Yogurt, greek, non-fat, plain 2 qt. 2 c. 5 lbs. 1 gal. 1 qt. 10 lbs. Cumin, ground 1 ½ tbsp. 3 tbsp. Garlic, minced 2 tbsp. ¼ c.
Cilantro, chopped 1 c. 2 c.
Brown rice, cooked with no salt added 3 gal. 2 c. 6 gal. 1 qt. Pita bread, whole wheat, 6" 50 ea. 100 ea.